My name is Corina St. Martin and I'm creating a sweet and funny place called The Dirty Candy Shop. 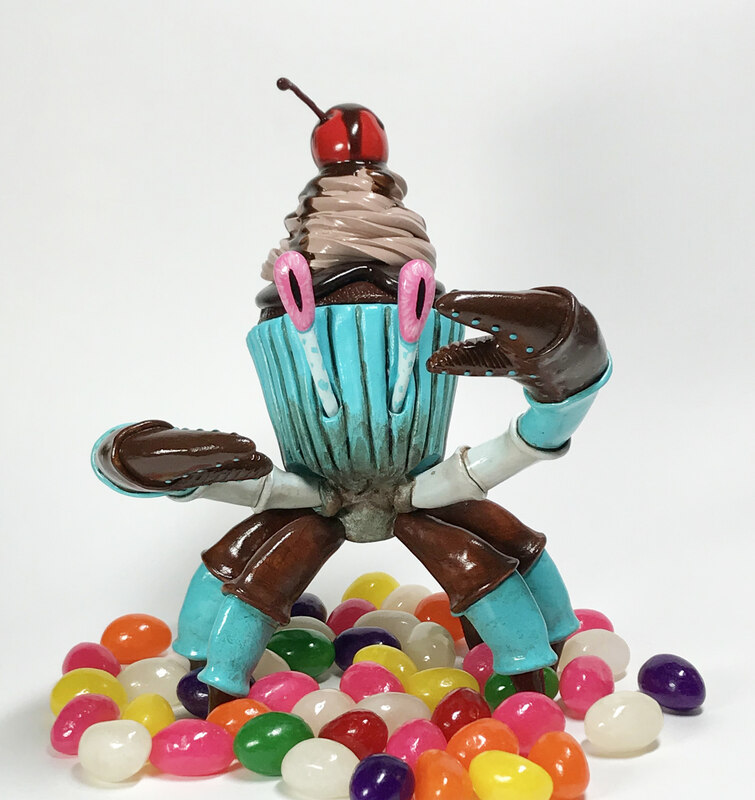 In it you'll find candies and desserts that have developed personalities, animals that may resemble candy, pastries and ice cream, mixed together with sarcastic humor a touch of surrealism and plenty of whimsy. I actually started down this path a few years ago but put it on the shelf, it wasn’t quite ready yet. The idea needed more ingredients and a lot more baking time so to speak. Then last September while playing with some Sculpey three crazy looking candy corn pendants arrived with stories to tell. One was quite frazzled after having been stuck for several months under the seat of a very bad driver who rarely used the brakes and loved Tibetan throat singing at max volume. Another spent time being batted across the kitchen floor by a cat with nothing better to do. He was finally able to get away after having been lost under the fridge. The third had fallen on the sidewalk and was lost after a trick or treating incident last year. He stared up at the stars for all this time so he's a pretty happy camper since he's discovered the meaning of life. Everyone has a story and we’re all a little or a lot wounded. The best thing to do is help each other as best we can and try to laugh as much as possible. So what's in it for you? First of all, I hope you laugh! I hope that you find joy in my creations and that they make your day a little (or a lot) brighter. You get to see behind the curtain of how I work both in 2d and 3d works. The bad work and the good along with my sculpting process and the various tools that I use. You'll automatically get first dibs on any new art for sale. Plus I'll be having giveaways on occasion! After I get this off the ground I'll be posting tutorial videos as well. I'm nervous and excited, I hope you'll join me because starting out on an adventure is always better when you're traveling with friends! Thank you so much for your support! Welcome to the candy shop! Woohoo!! Thank you so much and welcome to the candy shop! Every two months you'll receive a mini candy collectible in the mail. It might be a shocked Cherry Cordial character or maybe a Mad Peppermint or even a Campfire Marshmallow! Each month will have a new theme. You'll receive your first candy character after your second pledge. Then you can expect a new collectible every two months. This pledge includes shipping in the U.S. only. Every month you'll receive a mini candy collectible in the mail. It might be a shocked Cherry Cordial character or maybe a Mad Peppermint or even a Campfire Marshmallow! Each month will have a new theme. You'll receive your first candy character after your first pledge. Then you can expect a new collectible every month. I’ll be purchasing a pressure pot and mold making materials for making resin castings. Also various supplies as needed.